The spring holiday is the perfect time to read. We can let our imaginations run with ideas for how we might make change in our world. If you know a budding young activist - or perhaps you are one yourself?! - these true stories about kids from around the world are just the right inspiration. 44 Hours or Strike! by Anne Dublin, Second Story Press, When their union goes on strike, sisters Sophie and Rose are in for the fight of their lives. The Toronto Dressmakers’ Strike of 1931 brings young sisters Sophie and Rose together in their fight for better working conditions, decent wages, and for their union. It’s a tough battle as distrust and resentment of immigrants is growing, with many people blaming their poverty and difficulties on these workers. Sophie and Rose are faced with unexpected — and sometimes violent — barriers, and they quickly find that a strike is more than just a march. A is for Activist, by Innosanto Nagara, Triangle Square, A is for Activist is an ABC board book written and illustrated for the next generation of progressives: families who want their kids to grow up in a space that is unapologetic about activism, environmental justice, civil rights, LGBTQ rights, and everything else that activists believe in and fight for. 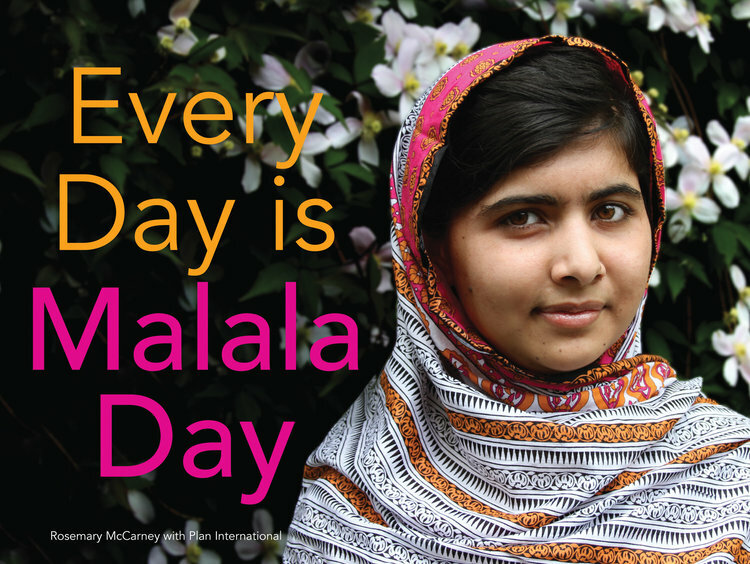 Every day is Malala Day by Rosemary McCarney and Plan Canada, Second Story Press Malala Yousafzai - as of October 2014, the youngest person ever to win the Nobel Peace Prize - is an inspiration. This is a letter to Malala, illustrated with beautiful photographs from Plan International. Girls from around the world express their sympathy, sisterhood, and admiration for her. Many of them know first-hand the barriers that stand in the way of girls going to school – barriers like poverty, discrimination, and violence. In Malala these girls recognize a leader, a champion, and a friend. 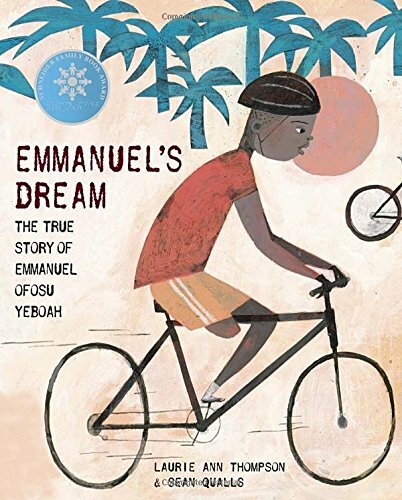 Emmanuel’s Dream: The True Story of Ofosu Yeboah, by Laurie Ann Thompson, Schwartz and Wade Born in Ghana, West Africa, with one deformed leg, he was dismissed by most people—but not by his mother, who taught him to reach for his dreams. As a boy, Emmanuel hopped to school more than two miles each way, learned to play soccer, left home at age thirteen to provide for his family, and, eventually, became a cyclist. He rode an astonishing four hundred miles across Ghana in 2001, spreading his powerful message: disability is not inability. Today, Emmanuel continues to work on behalf of the disabled. Shannen and the Dream for a School, by Janet Wilson Second Story Press This is the true story of Shannen Koostachin and the people of Attawapiskat, a Cree community in Northern Ontario, who have been fighting for a new school since the late 1970s when a fuel leak contaminated their original school building. Shannen will never see her dream fulfilled. Tragically, she was killed in a car crash in 2010. Her family, friends, and supporters are continuing to fight and to honor her memory as they work for equality for children in communities everywhere. The Streets Are Free, by Kurusa, Annick Press, For the children of the barrio of San José de la Urbina in Caracas,Venezuela, their only playground is the busy streets. Where once there were fields and streams, the landscape is now defined by office towers, sewers and highways. With the help of the local librarian, the children ask the mayor for a vacant lot to build a playground, but all they get are empty campaign promises. Even when a reporter’s news story brings the mayor out to launch the project, nothing further happens. Finally, it is up to the kids themselves to make their dream come true. Undeterred by the obstacles in their path, they rally family, friends and neighbors, who unite to create a space that the children can call their own. Our Rights: How Kids are Changing Our World, Janet Wilson, Second Story Press A girl who spoke out against her government for the rights of aboriginal children, a boy who walked across his country to raise awareness of homelessness, and a former child soldier who wants to make music not war. Here are true stories of kids just like you who are standing up for their rights. Read about how they have made a difference. Dylan Mahalingam from the USA started an online charity to raise money to fight child poverty. The bravery of Nujood Ali Mohammed from Yemen inspired other girls who were being forced to marry too young. Anita Khushwaha from India became a beekeeper to pay for school, even though it was considered a job only men could do. All of them are making a difference for children’s rights.